TechnicBRICKs: TBs TechPool 11 (Results) - Which is your favorite flagship? TBs TechPool 11 (Results) - Which is your favorite flagship? 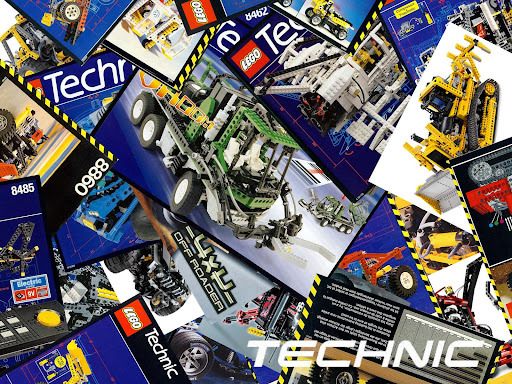 After 3 weeks and over 600 votes, another TBs poll has ended and we got an idea about which TECHNIC sets, are actually the favorites since ever. Not even one set belonging to this poll, ended without being voted! The voting results is following almost an alternate year pattern, since 1988. 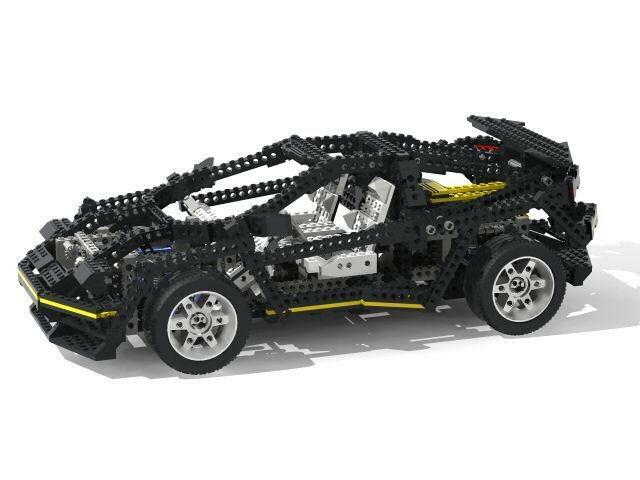 It supports those who say that for more than a decade, TLG is releasing a TECHNIC flagship every two years. The only exception was for the years 1996/97, when the TECHNIC line got to real and admittedly flagships, in consecutive years with the sets 8480 and 8479 respectively. It would be probably very difficult to get fair and normalized results from a poll like this, with votes gathered this way. Maybe that's why, I haven't done such a poll before and was somehow reluctant to do it. Definitely the Bulldozer (8275) is a great set! But apart from its playability, being very fresh in the memory of everyone and already an icon due to the PFS introduction, I doubt its 4 new motors and not so much mechanisms, would justify the #1 position with such significant advance. The most recent sets may be seen to be always favored, since they are naturally the most popular among the younger. Even those who are not younger, may tend to better remember about the newer sets or fell them more appealing, specially if had not played with the others, at the time they were released. Some old sets are still very nice looking, others not so nice looking anymore but still represent a big step forward, at their time. But not all would be able to recognize it in a short reflection, if haven't been thinking about that before. Besides that, when you consider the fact that there is now (IMHO) a better selection of parts to choose from than ever, available for designers to make their models, sets like 8880, 8480 or 8868 are actually doing very well, against their more modern rivals. I also don't fully agree with the winner. The buldozer is a nice set, no doubt, but it lacks functionality. It's "just" a great, remotely controlled vehicle. With no amazing functions. The second one, mobile crane, is a lot better. It offers a huge variety of functions plus both an el. motor and pneumatic. It would be interesting to know which would have been the results, if everyone just had the chance to choose and vote for one single set. Maybe it have leaded into something different, as anyone must think deeper about which his/her choice was going to be. 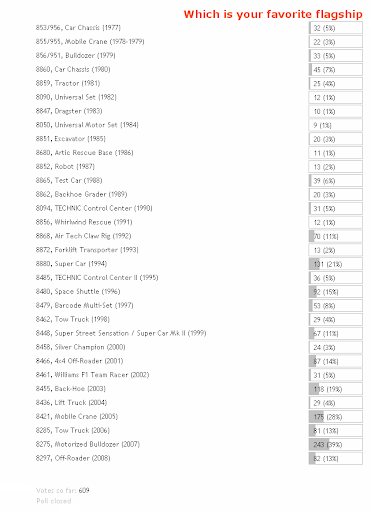 On the other way, most likely some older and very good sets, could have had almost no votes. And it was possible that choices had been focused on fewer of the same sets. I'm personally also very happy to see the Back-hoe (8455) in 4th place. However somehow disappointed because it was in 3rd almost all of the time, and dropped to 4th in the last mile... Well in the last few days. Another of my favorite flagships is the 'Barcode Multi-set' (8479) which had a very interesting and uncommon playability. However we can only realize on that, after had been playing with it, as it happened to me as well. The old 8865 'Test Car', was a set which I always thought too ugly, but which got in love with, after had built it quite recently. I am A little surprised at the results and while I love the fact this poll was created I understand that this kind of poll can't really be a true measure of which is the best flagship. Whilst trying to dream up a good suggestion of what exactly is a good way of finding out which is the best, I still stand by my favorites, the 8480, 8880 and 8868. I would add 'Playability' for instance. multiple polls 1 vote each.